Properties in Mount Airy average 4.8 out of 5 stars. Property 1: Located in the heart of "Mayberry"
Property 5: A Century-Old Charmer! Around the corner from Wally's and only Three Blocks to Downtown Mount Airy! Property 7: Around the corner from Wally's and only Three Blocks to Downtown Mount Airy! Property 10: Mayberry "Sentimental Waltz"
Property 11: Dog Friendly Vacation House / Cabin at a Winery & Vineyard ! Property 12: Described as - A Very Special Place, Serene & Beautiful, Our Dogs are in Heaven. THE CABINS AT WHITE SULPHUR SPRINGS "TASTE THE SIMPLER LIFE"
Property 13: THE CABINS AT WHITE SULPHUR SPRINGS "TASTE THE SIMPLER LIFE"
Mountain Time On The BlueRidge Parkway!! Property 17: Mountain Time On The BlueRidge Parkway!! 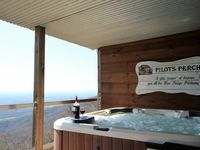 Located Atop The Mountain , This Cabin Has An Awesome View Of The Piedmont. Property 25: Located Atop The Mountain , This Cabin Has An Awesome View Of The Piedmont. Fancy Gap Va overlooking Pilot Mountain, fantastic seven county views. Property 29: Fancy Gap Va overlooking Pilot Mountain, fantastic seven county views. Long Range Views From Beautiful Log Cabin! Property 38: Long Range Views From Beautiful Log Cabin! Million Dollar View - Mountain Majesty!!! Property 44: Million Dollar View - Mountain Majesty!!! Pilots Perch is a little bit of heaven even on the cloudy rainy days! There are no words to express the beauty of this little bit of heaven! The owners are so thoughtful and attentive!! We had a lot of rain and heavy fog with occasional clearing and sun! Even in the heavy clouds we felt like we were on cloud nine! There is beauty in every moment. We enjoyed every one of them and made great memories with friends. Looking forward to our next visit! We stayed at a cute house in Mount Airy, NC with a big front porch that greeted us with wicker and rocking chairs! Upon opening door soft lighting welcomed us inside to a cozy inside with hardwood floors and antiquey furniture.... We enjoyed our stay in the quaint town enjoying not only the wedding and reception but sights of mountains, wineries and Mayberry! Thank you for sharing your home with us!